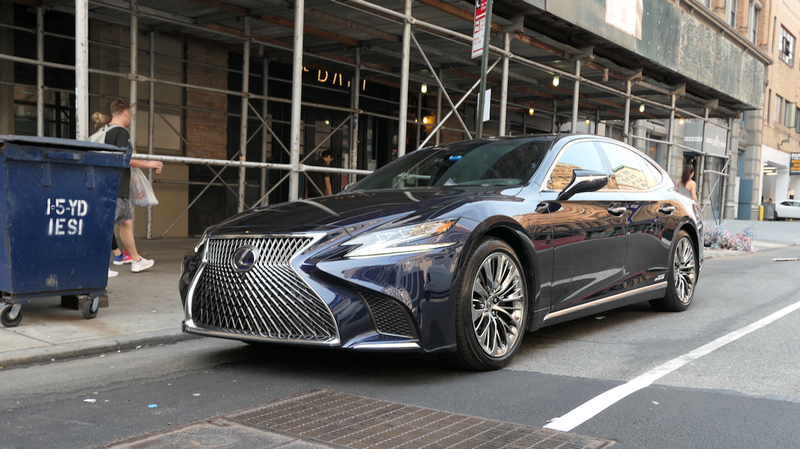 What Do You Want to Know About the 2019 Lexus LS500h? I am a passenger against my will. I have, essentially, been kidnapped. I’m being forced to go to the Woodward Dream Cruise, something which I am entirely convinced is only for the Olds, and which David Tracy and Erin Marquis insist is “awesome.” But we’re driving there from NYC in a Lexus LS500h, and so far, it’s fantastic. I’ll get to the Lexus in a minute, but allow me to explain myself about Woodward. I’m not from Detroit. Before I worked at Jalopnik, the only time I ever went to the Midwest was to look at colleges. I tried to avoid it like the plague, since it’s full of strange excuses for chili and people who drink milk. It’s also home to the Woodward Dream Cruise, which I am opposed to on principle. I’ve had people desperately try to explain it to me, but I’m still trying to fathom what could POSSIBLY be interesting or fun or exciting about a bunch of Boomer cars driving, in a straight line, slowly. Obviously (if you haven’t stopped reading this admittedly awful take by now), I am wrong. Well, it’s not obvious to me, but all my coworkers keep yelling me about it. That I must be “some sort of moron,” who has “no idea what he’s talking about.” David Tracy even might have made a slightly concerned face, which in true Midwestern fashion is the equivalent of a bloodcurdling scream. My dumb opinions had to change, they said. For the sake of the cars, they said. I had to go to Woodward and see it for myself, they said. Whatever. If I’m going to have to go to this thing, I demanded to go in some damn fine splendor. Which explains the Lexus. As I write this, I am sitting in the primo Lexus seat. The right back seat, that is. My seat is reclined, my ottoman is extended, the massager is set just so. The only problems I have to deal with are the terrible music selection of driver and Jalopnik social media editor Aaron Brown (how much Steve Miller Band can one man listen to??? ), and my increasing rage about being forced to go to an event that I anticipate will really just be watching 1957 Bel Airs sit in traffic. Again, whatever! I’m in a big luxury Lexus! Can’t complain too much. It’s splendidly luxuriant. It’s comfy, it’s quiet. The leather is soft, the hand-cut Kiriko glass is shiny, and the hand-folded origami door panels are pretty. It’s monumentally large. Normally I hate a big car, but this is a Lexus LS. Make it the size of a mountain, I say. The interior is full of lovely little design details in a way that feels modern, yet classy. That’s a hard thing to pull off without going way into the “tacky” zone, but it looks like Lexus has done it. This is something Lexus has done for years, and maybe that makes me a Luddite for not getting with the program, but the infotainment screen is really only adjustable from a touchpad, like the one on your laptop, on the center console. But there are plenty of buttons and knobs for the essentials. The Mercedes S-class has heated armrests, and the Lexus does not. I know that seems nitpicky, but in this level of luxury it’s about the details. That’s kind of it so far? Even the big Lexus grille works on a big barge like this. So what do you want to know? Drop your questions in the comments below and I’ll get to them as soon as I can.